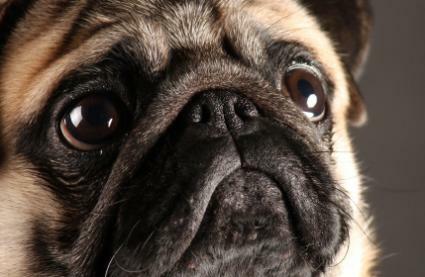 I admit I am extremely partial to pugs, owning two of them. It’s not the mushy face, the big, soulful eyes, their mischievous personalities, the funny snorting and grunting sounds they make because of their small noses or the fact that they constantly want to cuddle with you all day long and make the most amazing, affectionate pets. I think the reason why I love them so much is because they are quite easily the most human-like of all the dog-breeds and act like innocent 2-year-old kids. 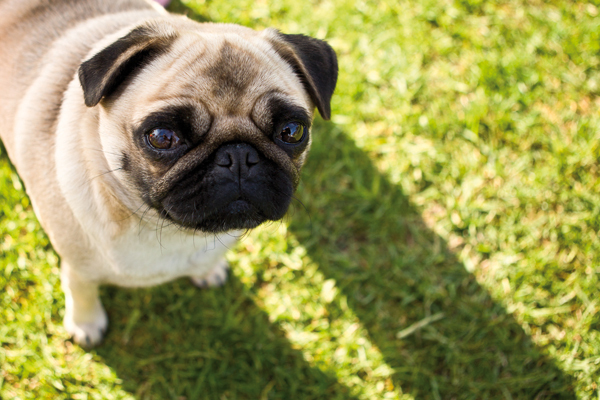 Spend enough time around a pug, and very soon you’ll learn how to understand them and see how they think. I’ve known people who don’t like dogs fall under the charm of the pug within hours. If what Aivanhov says is true about animals, then I am perfectly convinced that pugs are little angels in disguise just for the way they instantly make everyone around them smile. One thing that has always intrigued me about animals is their intelligence. They have an intelligence all their own and one which we humans don’t have anymore, largely based on instinct. I especially find how they somehow know things in advance, particularly natural disasters most intriguing of all. Apparently ants start carrying away their eggs before earthquakes. 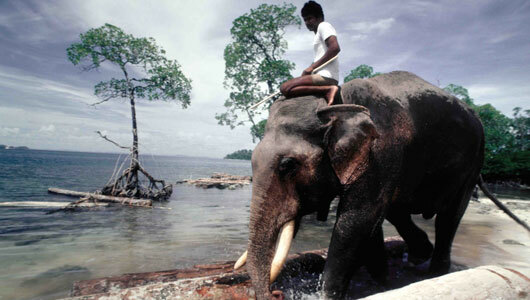 Divers have said that during the morning of the Asian tsunami of 2004, there wasn’t a fish to be seen anywhere in the water and in Sri Lanka, apparently as early as 10 days beforehand, elephants were heard screaming and running towards higher ground. Another talent dogs have is how they can “sniff” a person out, particularly those persons who may not have the best interests of their owners. Many a time I have watched my pugs closely and how they react when I introduce them to someone new, and the smarter one, Berkeley who I consider my wise old man-pug/Yoda wannabe, in consistently correct. If he’s crazy-happy then I know the person is worth knowing, but if he’s reserved or indifferent, then I know that there is something to look out for. Native, Aboriginal and shamanic cultures all over the world have always said that animals are our brothers and sisters, and that we are to live in respect and in relationship with them. Researchers have said that we actually do share something like over 70% of the same DNA with them. That animals carry medicines, teachings and symbols we would be wise to understand and not dismiss as easily as we do. That’s how the idea of the totem animal came to be in tribal cultures. For example, if you were a Hopi Indian belonging to the snake clan, then the snake offers special teachings to you, special lessons and special medicines and that whenever you have an encounter with a snake, either in real life or in the dream world, to be extra alert, because it’s bringing a message to you from the spirit world. 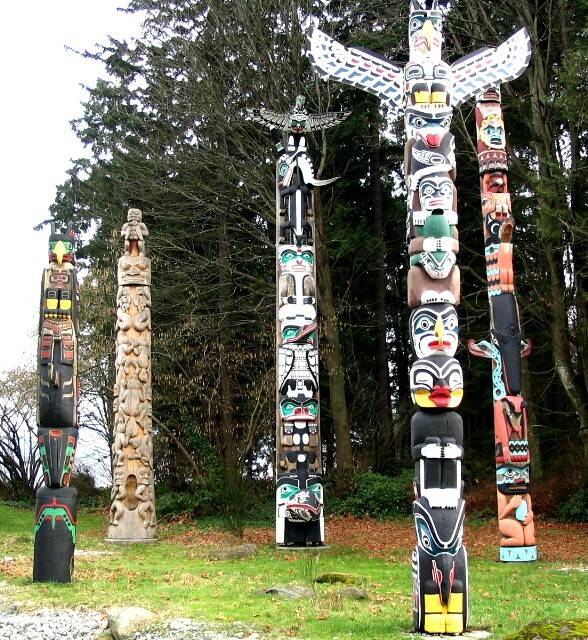 Totem poles usually are a sculptural history of the clan or tribe in symbolic form. I think it’s an idea which we need to revisit and more people need to know about, if anything than to foster more respect to the natural world. 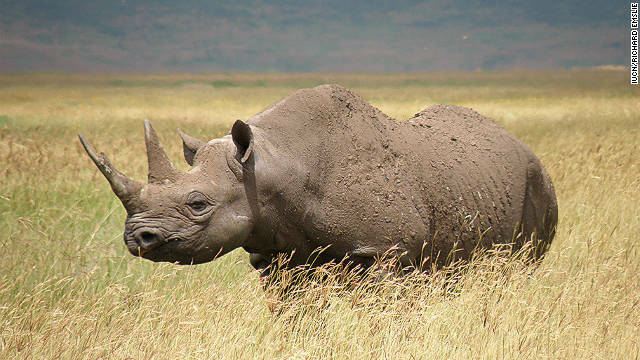 This past week, the African Western Black Rhino officially became extinct and it really, really bothered me. My dad grew up in West Bengal during the 1930’s and heard Royal Bengal tigers roar regularly in the jungles outside of some of the villages of Murshidabad. 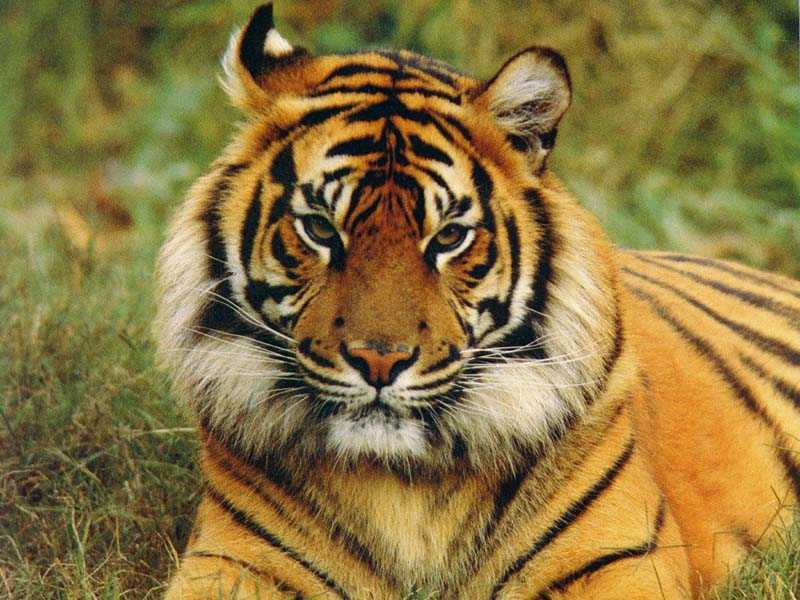 From populating the jungles of Bengal all the way to Indonesia across South-East Asia, they are on their way to extinction now, largely due to idiotic poachers who use animal parts for “traditional medicine” of all things. Another one on the way out. I’ve read that tiger’s penises are particularly prized as an aphrodisiac for men in Chinese medicine. To kill such a magnificent creature for the sake of some stupid man who wants to maintain an erection and prove his puny manhood only makes that man an even punier human being in my mind. That’s just one example of many others. 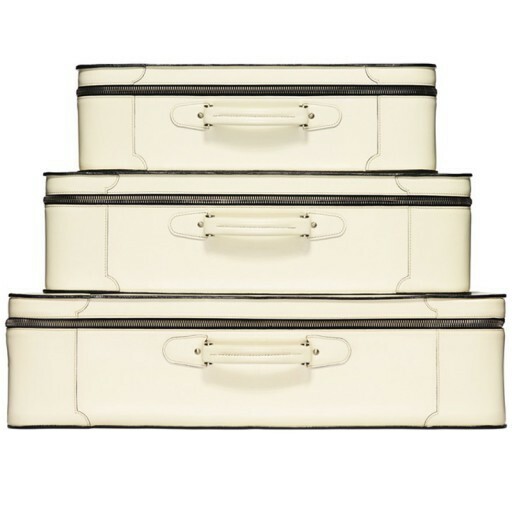 3-piece Valextra suitcase set, priced at $25 000-$35 000 please. The uber-posh Italian hand-bag company, Valextra used to make luggage out of hippopotamus or elephant skins for the likes of 1950’s jetsetters like Aristotle Onassis and Maria Callas. The bar-stools on Onassis’ yacht, the Christina O, were covered with the hides of the foreskin of minke whales. I really think the rich are beyond retarded sometimes. 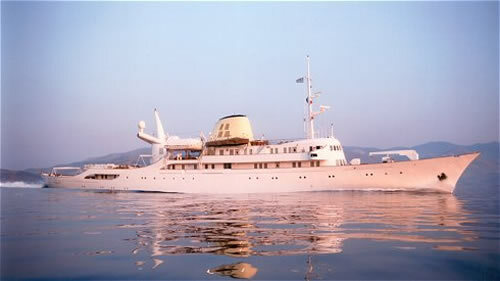 The old Onassis yacht which can only be rented out by the uber-rich. Ecology talks about ecosystems and ecological niches specific species and animals take up in order to maintain the whole. Native thought talks about the Web of Life and like a spider’s web, each strand has its place in keeping the whole. With each species disappearing, it reduces that Web of Life and that, in turn reduces us all. Like I posted earlier this month, something strange is happening in the Pacific Basin. The animals are acting very strangely. The normally loud orca whales have stopped singing. Whales in Native thought represent the history and record keepers of this planet, being the largest mammals as well as one of the oldest. 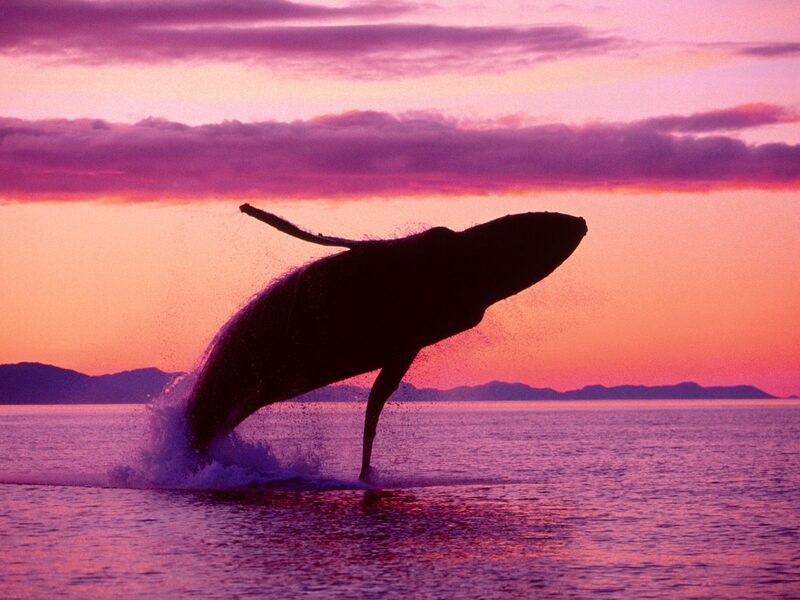 They believe whales hold the memories and stories of this planet from the very beginning particularly in their songs. I’m sure if the day came when we all could understand their songs, then their stories would astound us all. Here’s a video of a whale, showing her attitude of gratitude, a lesson we can all learn from. The “Thank You” here is clear enough. We had a very similar experience down south in Turkey, off the coast of Butterfly Valley near Fethiye, saving a cachalot (sperm whale). We were a dozen of scuba divers aboard finishing our tour when we thought we saw a small ‘island’ which slowly started to move towards the land. She was about to commit suicide heading the rocks, wrapped up all in fishnet from her mouth to tail, her back stuck like a hunchback. We could cut off the tight net paralyzing her from the mouth to tail, giving her freedom to move, but then she started making rolls in the water causing a vortex, so we had to keep our distance. She rolled a bunch of times showing us her wounds, especially the severeness of her mouth and tail. There was a definite communication. When we were in the water we could hear her pain and cries. And those who made it next to her (I couldn’t dare, she was huge!) saw the look in her eyes. Hard to explain. Well, the story is long and phenomenal, but very touching with loads of challenges with the authorities, the military, the fisherman, but the end is happy. We did save her! She was rescued with the help of the marines and was followed safely in the Mediterranean until she left Turkish waters. She made it to the national news, we made it to the Scuba magazine. It was an incredible experience, still hard to believe, giving me the chills, reminding me of precious life of all forms. I just read this morning that cows have regional “dialects”. Only mention it because it says something about how little we really know about other animals. My wife, Sopheak, lived in the jungle alone for about 2 years when she was just a girl. One night she dreamt that she was sleeping in her mother’s arms. Woke up to find a tiger’s paw protectively laid across her back. 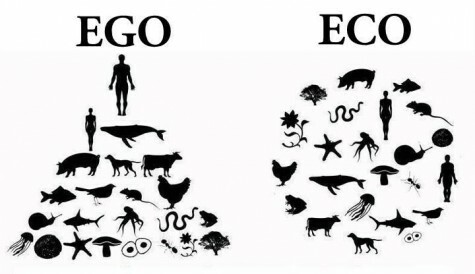 It’s only our idiotic human conceit that tells us we are superior to animals. They are awesome and could teach us so much if we weren’t possibly the densest animals on the planet. We hardly know anything about animals and it would seem that before we can really discover their true nature, they are being killed off as rapidly as possible. Scientists watch their mating habits, what they eat, where they live and how the migrate and those scientists employed by corporations research to see what use we can get out of them. Some nations have a more enlightened approach to dealing with them, India recently declared dolphins and whales as “non-human persons”. Japan, the Faroe islands and Norway in the meantime continue the whale hunt in the name of “cultural heritage”, nevermind the fact that no one wants to eat whale meat or dolphin meat anymore. Man is the number one threat to the natural world, I’d like to see what bankers, real estate developers, CEOs have to say when the day comes when there won’t be anything natural left to eat, drink or breathe.